Looking for an original Valentine’s Day present? We recommend a gift donation to World Land Trust’s Borneo Rainforest Appeal in celebration of the magnificent hornbills of Kinabatangan. 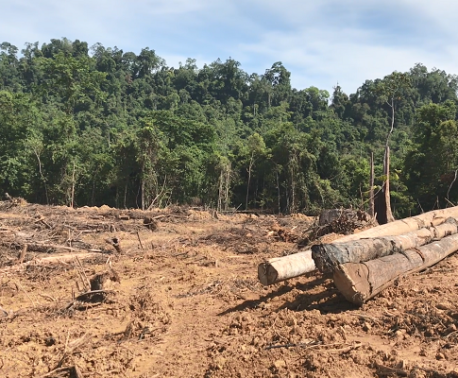 Funds from WLT’s Borneo Rainforest Appeal are being used to extend Lower Kinabatangan Wildlife Sanctuary in Sabah, northern Borneo. Lower Kinabatangan Wildlife Sanctuary provides habitat for an amazing diversity of wildlife. As well as sheltering 10 species of primate, the wildlife sanctuary is home to 189 species of birds, among them all eight species of Borneo’s hornbills including the Asian Pied Hornbill (pictured). Why celebrate hornbills on Valentine’s Day? 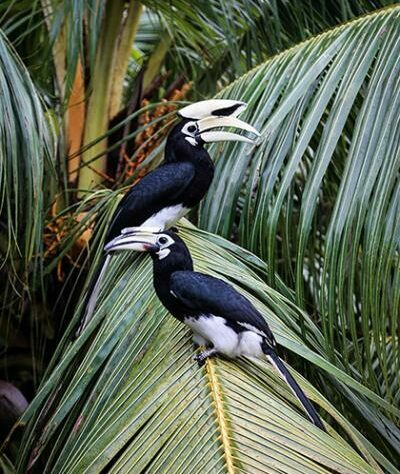 First, hornbills generally mate for life. They form strong pair bonds and are often highly selective in their choice of mate. Second, the hornbill’s breeding season is from January to April, which neatly coincides with Valentine’s Day. More importantly, five of the eight species of hornbill in Kinabatangan are registered as near threatened on the IUCN Red List, among them are the Rhinoceros Hornbill and the Helmeted Hornbill. The hornbills of Kinabatangan live mainly on a diet of fruit and they rely on the large, natural holes of mature trees in which to build their nests and fledge their young. Hornbills are also known as the gardeners of the forest because they disperse a variety of seeds. But, as the Bornean forests are felled, so the hornbills’ chances of survival diminish. Concerned that hornbill numbers are decreasing due to the lack of enough suitable trees for nesting, staff at Hutan – WLT’s conservation partner in Malaysia – have been installing nesting boxes as a temporary measure while they wait for the trees that are being replanted in regraded areas to grow to maturity. WLT has been supporting Hutan’s conservation efforts in Malaysian Borneo since 2008. 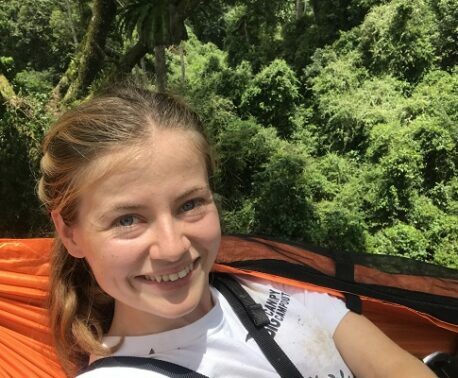 WLT’s current special appeal, the Borneo Rainforest Appeal, aims to raise a million pounds to purchase and protect land in a corridor along the north bank of the Kinabatangan River, linking two existing forest reserves. So, on Valentine’s Day, please make a gift donation to the Borneo Rainforest Appeal – and help WLT save more forest for Kinabatangan’s glorious, monogamous, eyelash-fluttering hornbills. You can make a Valentine’s Day Gift Donation to the Borneo Rainforest Appeal by clicking the orange button below. If in PDF format, the Certificate will be sent by email to you (please note we cannot send PDF Certificates directly to gift recipients). Valentine’s Day gift donations to be sent by email: last order date 13 Feb 2014. If in printed form, you can choose to have the Certificate sent to you or direct to the gift recipient. Allowing for postage times, Valentine’s Day gift donations to be mailed: last order date 11 February 2014. The Certificate is included in a WLT Gift Pack, which contains more information about WLT and the Borneo Rainforest Appeal.